Touted as San Francisco’s most historic building, the Officers’ Club—once a social hub for U.S. Army officers and their families—has roots that go back to the earliest days of Spanish settlement, in the late 18th century. The Presidio Trust’s October 4–5, 2014 reopening celebration culminates a three-year revitalization project, which improved seismic safety, repaired the historic adobe walls, and transformed the Officers’ Club into a multifaceted cultural destination. There’s a lot to see and do in this new visitor gateway, which also houses new classrooms and event spaces. 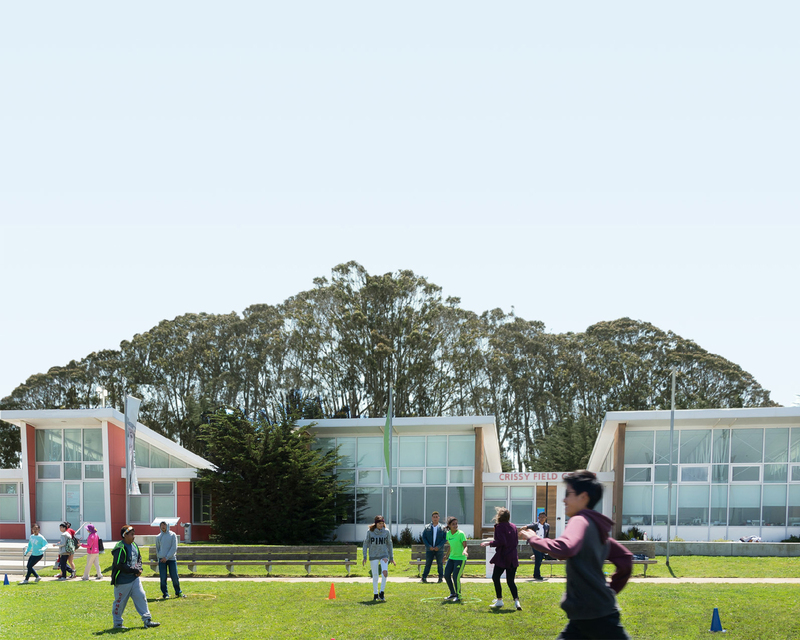 Here’s a quick primer on eight essentials to enjoying the Presidio’s newest attraction (open every day except for Mondays; free admission, thanks to support from the Presidio Trust). Full details are at www.presidio.gov/poc. 1) Come face-to-face with wall-to-wall Presidio history. The Mesa Room (above photo) is a can’t-miss. Here, you’ll have a first-hand encounter with the layers of the Presidio’s rich history. You’ll see an exposed portion of the original adobe wall, with bricks dating to the earliest years of the Spanish fort. Another part of the room preserves the clapboard of the 1880s, as well as the “Mission Revival” look of the 1930s. No more wondering “if these walls could talk.” They’re testifying to history! 2) Bring the family for crafts and lively performances on weekends. Saturdays and Sundays feature kid-friendly crafts (perfect for youngsters ages 5–12), themed around the Presidio’s rich natural and cultural heritage. On Saturdays, energetic performances—ranging from taiko drumming to hands-on shadow puppetry to Mexican folk music and dance—are sure to delight the whole family! Free. For a listing of “Family Special Events,” visit www.presidioofficersclub.com/calendar. 3) Groove and mingle with musicians on Friday evenings. Stars of screen and stage—including Bob Hope, Joan Crawford, and Jack Benny—once entertained military brass in the Officers’ Club. Now the old joint is jumping again! Curated by the San Francisco Friends of Chamber Music, “Presidio Sessions” showcase jazz, classical, and contemporary music in an intimate setting every Friday night. Free. Check www.presidioofficersclub.com/calendar for upcoming performances. 4) Feed your mind with thought-provoking speakers and films on Thursdays. “Presidio Dialogues” bring noted authors, historians, and innovators to the Presidio to engage with the Bay Area community. Interactive talks, panels, and films explore the full breadth and depth of the Presidio/San Francisco/California experience—past, present, and future. Free. Visit www.presidioofficersclub.com/calendar for upcoming events. 5) Wander the Presidio Heritage Gallery—and wonder at the complexity of this place. The 4,000-square-foot interpretive core of the Officers’ Club, the Presidio Heritage Gallery tells the story of the Presidio through fascinating artifacts and interactive exhibits. More than just a museum hall expounding dates, facts, and historical figures, the gallery is an opportunity for visitors to connect their own story and experiences with the Presidio. 6) Marvel at Andy Goldsworthy’s newest installation in the Presidio—Earth Wall. You’ve been awed by Goldsworthy’s previous work in the Presidio—Spire (2008), Wood Line (2011), and Tree Fall (2013). Now see his latest piece! Tucked in an Officers’ Club courtyard, the ethereal Earth Wall encompasses a sphere of curved tree branches emerging from a rammed-earth wall. Learn more about Goldsworthy’s Presidio installations, and our Art in the Parks initiative. 7) Enjoy a meal—or a beverage or two—at the Presidio’s newest restaurant, Arguello. No trip to the Officers’ Club would be complete without a nibble or sip at Traci Des Jardins’ Arguello, slated to open on October 8. Named for Mexico’s first governor of California, the restaurant features contemporary Mexican flavors (just as Arguello’s sister restaurant, The Commissary, showcases Spanish-influenced cuisine). Don’t miss the cozy heated patio in the back! 8) Dig deeper into the Presidio’s past through archaeology. The Archaeology Lab, located adjacent to the main Officers’ Club building, is the headquarters for archaeologists uncovering the footprint of El Presidio—the original Spanish colonial fort established here in 1776. With an “open lab” and “open site” approach, visitors can experience an active archaeological dig seasonally! Lab tours are available periodically.